1st Annual FTJ Fair a Great Success! “Who knew there were so many beautiful Judaica products made by fair trade artisans around the world?” was one of the most overheard comments at Fair Trade Judaica’s First Annual Fair in Berkeley on October 17. Attendees were excited to find a range of beautiful and interesting Judaica products, influenced by the local cultures in which they were designed, from beaded mezzuzahs made in Guatemala, to over ten different kippot (crocheted, knitted, sewed, collage of recycled soda cans) from Guatemala, South Africa, and Thailand, to embroidered challah and matzah covers made in Guatemala. 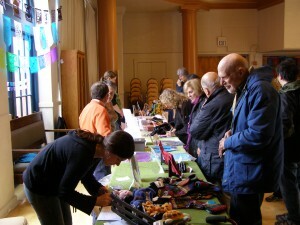 The stories behind the fair trade organizations and the products captured peoples’ attention. One organization, Mayan Hands, was started by a Jewish Guatemalan woman. After conducting anthropological work among the Mayan women for 20 years, she decided that it was time to give something back to them, and launched her fair trade business both to help provide them with income, as well as preserve their cultural and craft heritage. The idea for MayaWorks’ famous kippot, one of the first fair trade Judaica products available, happened when a local (Jewish) tourist was visiting the artisans, and saw the unsewn hackey-sack balls lying on the ground, realizing that they would also make beautiful kippot. And since then, they are one of MayaWorks’ best selling products. And, Partners for Just Trade’s new line of Judaica pendants was inspired by fair trade supporter Yochi Zakai who visited the artisans at their Peruvian shop. He wanted to buy something for his Jewish mother, but not seeing anything relevant, he worked with the artisans, Partners for Just Trade,and Fair Trade Judaica to launch a new line, including a silver star of David, and two hamsah designs.